Its all about inspirational and motivational true life quotes and pretty quotes with pictures, Hot indian actress images and Latest wallpapers of all celebrities, as well as Get love, funny and jokes SMS. of the earlobe        kneecaps       madrigal fat   of his belly       collarbone       toes. These words  he knows, but will not say: yes       horse       sleep       white. before dawn. First the alphabet,  then "Twinkle, Twinkle Little Star,"
say nothing. Never speak of that quiet  after the kicking stopped. Believe in time  he'll learn our cells betray each miracle  and wild conundrum they're coded to bear. If he needs an answer, give him morning   mass off  W. 16th: how aisle and chancel   roared with lilies and cornets; how we dared   a new unknown to find us, there, in song. Copyright © 2018 R. A. Villanueva. Used with permission of the author. "If you ask me about fatherhood, I will list aloud its wonders. And will add that my son draws circles wherever he finds space, that he waves goodbyes to bumblebees, shouts Hello! at airplanes and the moon and the East River ferry. I will sing for you his Why? with his many lilting syllables. There is a phrase from Mary Ruefle's essay 'On Fear' that I have come to know by heart: '…the holy dread with which we face that which we love most, or that which loves us the most.' This poem is unfinished; I will be writing it for as long as I live." 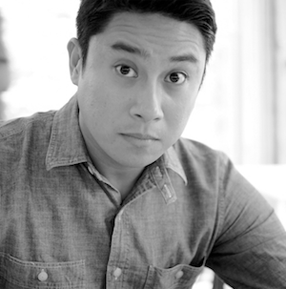 R. A. Villanueva is the author of Reliquaria (University of Nebraska Press, 2014), winner of the Prairie Schooner Book Prize in Poetry. He lives in Brooklyn, New York. Thanks to Adrian Matejka, author of Map to the Stars (Penguin Press, 2017), who curated Poem-a-Day this month. Read more about Matejka and our guest editors for the year. If you value Poem-a-Day, please consider a monthly donation or one-time gift to help make it possible. Poem-a-Day is the only digital series publishing new, previously unpublished work by today's poets each weekday morning. The free series, which also features a curated selection of classic poems on weekends, reaches 450,000+ readers daily. Thank you!